Three new applications help you create full characters, complete story plots, and flesh out entire worlds. With built-in Scrivener integration. All our software is available for Windows and Mac. Get fast support if you have questions. We offer three separate products - Character, Story, and World - so you can purchase just the help you need without paying for a large application with features you don't need. No subscriptions, no in-app purchases, no "pro" version. When you buy one of our applications you own it for life. There is no further cost. And, by the way, no internet connection is required to use any of our products. 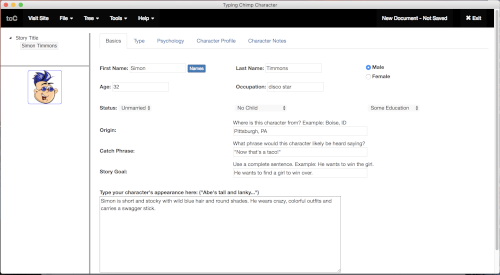 Typing Chimp Character is designed to help fiction writers create better characters fast. It leverages the Enneagram personality system to generate a core character profile that you then, as a writer, develop to completion. Or, depending on the depth needed for the character, can be used as is. Instantly create a full character profile for a secondary character and bring a new depth to your story. While immersed in writing your story, you don't have to go off on a tangent and get distracted by having to create a secondary character on the fly. Just name the character and choose a personality and Character will create a basic character profile for you instantly. The best part is that you don't need to know anything about the Enneagram or character development to create amazing characters (although it helps). Just fill in some basic info, choose a personality type, optionally choose a psychological issue, and hit "Generate" to create the full profile. Typing Chimp Story was designed to help writers build and organize their stories. The easy-to-use story tree allows you to quickly add new story elements and drag the elements around any time. It also includes a powerful story generator able to generate up to 1 billion different stories instantly. 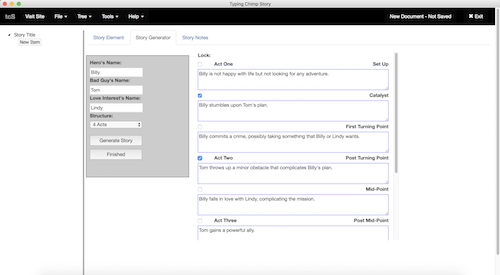 Based on decades of story structure study and analysis, the Story Generator offers options at each story point and provides a simple interface for quickly generating a simple story and story structure. Once generated, you apply your story ideas and flesh out your full story. If you need to reorganize your story, just drag and drop scenes or other elements around in the tree. 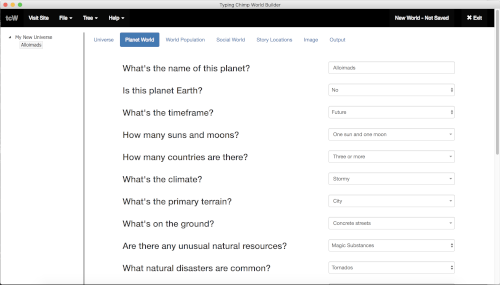 Typing Chimp World Builder application is designed to help you develop complex and complete worlds for your stories. Every story takes place in a multifaceted world that is sometimes difficult to create completely. Typing Chimp World takes you through the process with dozens of questions organized into world areas and then assembles your answers in one document for you to flesh out. It all starts with creating your universe. You can choose to make it the current universe we live in or select "Let's Start from Scratch" and create a completely new universe defining every element including everything from how the universe was formed to whether time travel is possible. Then you can add in as many planets as you like and define every element of those planets including how the planet came to be, what the inhabitants are like, what the social fabric looks like, and more. Once you've answered as many questions as you like, you can generate a complete planet profile in one document ready for you to flesh out and polish up. Buy one registration key for only $69.99 and get all three applications to help you create better characters, build and organize better story plots, and develop new and realistic worlds. Created by writers for writers. Typing Chimp software products help you take your writing to its next level. Started in 1998 in Santa Monica, California, Typing Chimp has been developing and selling software to writers for 20 years and we feel like we're ready to kick this thing into high gear. These three applications are new for 2018. Priced reasonably, integrated with the popular writing program Scrivener, and ready to help you build better characters, stories, and worlds. Let us know if you have questions, comments, or ideas. We'd love to hear from you!